Nike's suffering from oversupply. Micron's thriving from undersupply. In the current environment, investors are best off betting with chip stocks rather than sneaker stocks, Jim Cramer says. 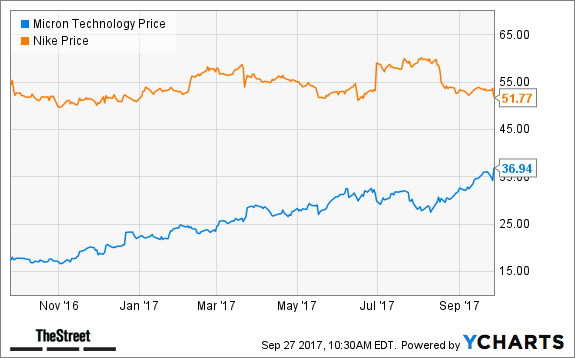 Micron Technology, Inc. (MU - Get Report) and Nike Inc (NKE - Get Report) are both in focus Wednesday, but not for the same reasons. Although both reported earnings, the reactions differ completely. To put it simply, one suffers from oversupply, the other is thriving from undersupply, TheStreet's Jim Cramer said on CNBC's "Mad Dash" segment. Shares of Micron soared Wednesday trading after the company beat on earnings per share and revenue expectations for its fiscal fourth quarter. Management's fiscal first-quarter guidance came in ahead of analysts' expectations as well. "There is no inventory in the system," Cramer said, explaining that supply continues to remain extremely low for Micron. That's giving the company pricing power, as DRAM and flash storage solutions continue to experience robust demand. Despite the strong demand, management has little desire to increase production, as datacenter, autonomous driving, Internet of Things and other booming industries continue to order hardware. Supply for Micron is "tight as a drum," said Cramer, who also manages the Action Alerts PLUS charitable trust portfolio. Micron Shares Could Double: Should You Buy It? Unfortunately, that's the opposite issue for Nike, where "there is way too much inventory," Cramer said. Everyone is pumping out new shoes, be it Under Armour (UAA - Get Report) (UA - Get Report) , Nike, Adidas (ADDYY or independent, internet-based companies. In the end, though, the market is being flooded with so many different shoes, it's hurting pricing power. The bricks-and-mortar model is breaking and Nike is trying desperate to get its direct-to-consumer model in full swing. "I've got to tell you, I don't like the way Nike looks," Cramer said. At some point it will be more attractive, because Nike will "be the last man standing" in the sneaker battle. But right now, if it's between chip stocks or sneaker stocks, go with chips, he concluded. Watch: Why Is Lonzo Ball Wearing Nike?